It’s no wonder that milk is our sole source of nutrition during the first 4 to 6 months of life when you look at what a nutritional powerhouse it is, specifically human breast milk. This may just be Nature’s most perfect food because it’s rich in high-quality protein, omega-3 fatty acids, and unique prebiotics (i.e. fermentable fiber). This helps to establish and maintain the ideal microbial composition in the gut of an infant. The down side is you’ll be hard pressed to find human breast milk in your local dairy aisle. However, there is a potential alternative, the high-tech version of old-fashioned dairy milk. It's called lactose-free milk. To explain my statement you have to understand the history of dairy milk and genetics. All newborn children have the enzyme (lactase) in their gut that allows them to breakdown the disaccharide lactose found in human breast milk to simple sugars (galactose and glucose) that can be absorbed. This is important since if the lactose makes its way to the colon, it is often the cause of gastric disturbances (i.e. lactose intolerance). Furthermore, galactose is not a very common carbohydrate. It has recently been shown that higher levels of galactose in the blood appear to be important in reducing insulin resistance (1). Children and other mammals nourished by maternal milk are genetically programmed to lose the lactase enzyme activity with time (2,3). In children, the lactase activity is usually gone by age 7, whereas other mammals lose this enzyme activity in a much shorter period of time (2,3). If there is no compelling reason to maintain gene expression for a particular enzyme, the body will divert its resources to other proteins that increase the chances for survival. This is why there is little evidence to show that Paleolithic populations had lifelong lactase activity since it gave them no evolutionary advantage (4). With the advent of dairy farming, a change took place in the ability to produce lactase. For those that continued to keep producing the lactase enzyme, they actually had a survival advantage over those who didn’t because milk could be used as a source of nutrition in times of famine, was a secondary protein supply (5,6) and an uncontaminated source of liquid. Today about 35% of the world’s population is lactose-persistent (meaning milk is an excellent source of nutrition for them), whereas the other 65% of the world’s population will have a difficult time consuming any dairy at all. Considering 10,000 years virtually no one carried this gene for lactose-persistence, this is a dramatic increase. The development of lactose-tolerant individuals has become the best example of natural genetic selection in humans induced by a cultural change (7). One of the first applications of biotechnology some 6,000 years ago was to reduce the lactose levels in dairy products. This provided new food sources for those individuals that were still genetically lactose-intolerant. Two of these early biotechnology products were yogurt and cheese. Yogurt was only a partial solution since the lactose concentration was still relatively high being reduced from about 5% in whole milk to about 3-4% lactose. However for many, that reduction was enough for them to tolerate the remaining lactose. Yogurt production uses live bacteria (i.e. probiotics) to partially reduce the lactose levels in yogurt by converting lactose into lactic acid giving yogurt its bitter taste. On the other hand, cheese production was much more efficient in lactose removal from dairy milk. This process used rennet (a complex of enzymes isolated from the stomachs of ruminants) to digest the lactose to galactose and glucose instead of using probiotics as in yogurt production. This is why some hard cheeses are nearly lactose-free depending on the production method and extent of aging. Unfortunately, all cheeses are also devoid of one of the key benefits of dairy milk: complex fermentable fiber. 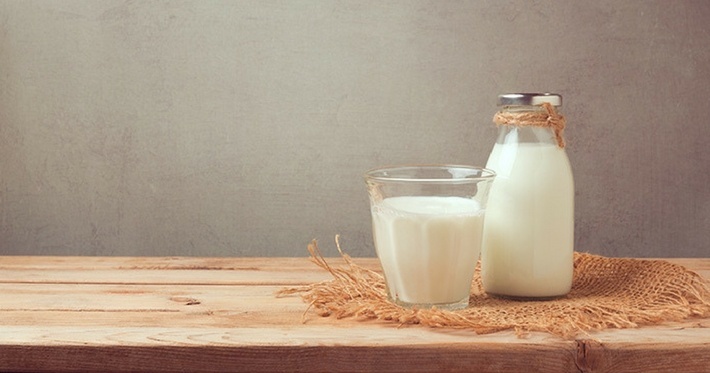 We still think of milk as primarily a source of protein and calcium. However, it may be the complex oligosaccharides (polymers of sugar molecules) in dairy milk that may have generated its significant survival benefits in ancient populations who continued to carry the gene for lactose-persistence (8). Human breast milk is the richest source of complex fermentable fibers, which determines the composition of the gut microbes in the infant (9). The microbes in the gut that breakdown the complex oligosaccharides in human breast milk into simple sugars unique to them, would have provided a very significant evolutionary advantage for colonization over their other microbial competitors for the prime real estate in the gut. If you are a microbe that doesn't get fed correctly, you simply don't survive in the gut. That dietary advantage can only be maintained if those newly established microbe colonies are being continually provided their "super-food". Although many plants are rich in fermentable fiber, those plant oligosaccharides are simply not as complex in structure compared those found in human breast milk. These less complex forms of fermentable fiber in plants would potentially allow for more unwanted microbial intruders to try and set up shop in the gut. Of course, eating a fiber-poor diet like the typical Western diet or following a ketogenic diet (both virtually absent in any complex fermentable fibers) gives greater access to even less desirable microbes to potentially take up residence in the gut. 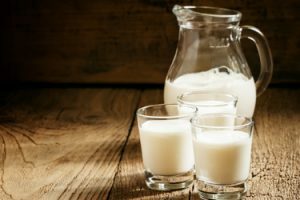 Although dairy oligosaccharides are not as complex as those in human breast milk, they are far more similar to those in human breast milk than fermentable fibers from plants (10,11). With our growing knowledge of the importance of microbial composition of gut to human health, it may be that the significant survival advantage of dairy products in lactose-persistent populations, may have much to do with their positive effects on the gut microbiota composition. This would also explain why yogurt has more perceived health benefits than cheeses. Although the yogurt is richer in lactose than hard cheese, yogurt is also far richer in dairy oligosaccharides than cheese. This is because the first step of cheese production (the precipitation of casein to make curds) also removes much of fermentable fiber in the milk. So perhaps the trade-off of greater lactose levels (a problem for lactose-intolerant individuals) is outweighed by the increased retention of complex diary oligosaccharides in yogurt. This hypothesis is reinforced by recent research that has indicated dairy oligosaccharides may be powerful agents in reducing inflammation just as are the more complex oligosaccharides in human breast milk (12,13). It was one of biotechnology’s first uses that gave many humans (those who maintained lactase production) a vastly improved survival advantage. These individuals had a greater chance for survival not only because they had a more consistent and plentiful source of high quality protein, but also because they had access to complex fermentable fibers that gave them a superior advantage in gut health and overall control of inflammation. Today modern biotechnology can take this a step further through the development of lactose-free milk. Using a similar enzyme technology compared to cheese making, it is possible to reduce the lactose level in dairy milk to zero without losing its unique oligosaccharides. Now you have a renewable source of high-quality protein as well as the complex oligosaccharides that significantly improve gut, and all readily available at your local grocer. In addition lactose-free milk contains readily available free galactose for easy absorption to reduce insulin resistance. Most importantly, you don’t need a have a genetic mutation (only 35% of humans do) to enjoy these benefits as long as you are consuming lactose-free dairy milk. As I said earlier, human breast milk is the ultimate super-food because it supplies high-quality protein, unique fermentable fiber, and omega-3 fatty acids such as EPA and DHA. Unfortunately, lactose-free dairy milk doesn’t contain any EPA or DHA. However, those omega-3 fatty acids can easily be supplemented with your diet to increase the resolution of existing inflammation to a far greater degree than the levels of the same fatty acids found in human breast milk. The combination of lactose-free milk plus high-dose fish oil as a dietary supplement may represent the next super-food applicable for everyone.